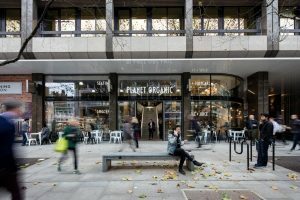 Planet Organic, the UK health food retailer that serves over 50,000 customers a week with freshly-squeezed juices and a wide range of organic ambient and chilled foods, has implemented a new retail enterprise suite through specialist IT provider itim. Al Overton, buying director at Planet Organic, says that the business needed a “platform to allow for future growth and a stable, end-to-end solution” to help manage everything from the daily ordering and replenishment of products on shelves to planning promotions and processing supplier invoices. The £35m retailer stocks over six thousand different lines, and around fifty new products are introduced each week. Products range from organic fruit and vegetables to organic bread and meat and sustainable fish from British waters. Every day, staff using handheld devices can simply scan items required for automatic ordering through a network of around 140 suppliers, with multiple deliveries a day to seven London-based stores. Stock is also regularly transferred between stores, especially organic fruit and vegetables which are used to make freshly-squeezed juices in cafés in all its stores, accounting for almost a third of annual sales. “Our cafés can get particularly busy and we have to be able to process transactions at the checkout quickly and efficiently, which is something itim’s technology enables us to do,” says Overton. Over half of its customers tend to be under the age of forty and a large proportion of students and young people flock to its stores and cafés in search of turmeric lattés and veggie lunch boxes, often lured by promotions and affiliations with local gyms and clubs. Planet Organic uses itim’s software to manage around 600 products on promotion at any one time and to boost sales with planned multi-buys and deals that are largely funded by suppliers. Online sales for direct delivery to a customer’s home are growing at about thirty percent a year, so doing this efficiently is paramount to success, it says. The company now has one central database to manage both online and bricks-and-mortar stores, instead of the two separate systems it was running before. Previously, this meant having to upload thousands of products twice, which was very time consuming and led to manual errors and duplication of data. “We didn’t want to end up bolting on different modules and running multiple systems across different channels,” says Overton. The retailer can now hold all the necessary information on one central database, including all the additional information it supplies on whether products are suitable for vegans, special dietary requirements (such as gluten or dairy-free), or details on ingredients used in its natural beauty brands and a wide range of high quality health supplements. Planet Organic makes about 1,200 deliveries a week throughout different boroughs of London, giving the option of same-day deliveries within selected time slots. It also delivers nationwide. Overton adds that picking for online deliveries has greatly speeded up thanks to staff now being able to use tablet computers on supermarket trollies to pass swiftly through the stores selecting the right products ordered. “Before, we had bottlenecks at the till because every product for multiple online orders had to be scanned through a checkout,” he says. Planet Organic has also managed to save a considerable amount of time by switching to EDI (Electronic Data Interchange, a standard for exchanging information between IT systems) and itim’s invoice matching solution, Didos. So, instead of previously having to manually process 120,000 pieces of paper a year, now, everything is electronically processed with invoices automatically matched against delivery notes. This has led to fewer queries on invoices and means being able to process higher volumes with less staff. “The time-consuming process within invoicing was one of the factors limiting our potential for future growth,” says Overton. The ease and speed of setting up promotions and discounts is much more efficient too, including being able to review the attractiveness of offers and seeing quickly what works and what doesn’t. Eric Adatia, finance director at Planet Organic, says he particularly likes the management reporting capabilities of itim’s software and the ability to “slice and dice” and provide meaningful insights on sales performance. Improved financial reporting and accuracy has also led to a reduction in unknown margin loss by fifty percent, which were discrepancies attributed to wrong pricing and stock information while using its previous systems. For example, stock loss figures from stores not reporting wastage correctly, or more often than not from theft, were previously hovering around four percent. This margin loss has now been reduced to two percent after running the new systems. Now that the company is equipped with better technology, it says it should soon be able to open more stores in London and launch more of its own branded range of organic products. It also intends to focus more on generating personalised offers and promotions for customers, as well as improving the integration with its suppliers for online orders.